Put a spin on a favorite dessert by using our Original mashed Potatoes in your cake batter and frosting. A perfect dessert for the sweetheart in your life! Set oven rack in the middle of the oven. Preheat oven to 350F. Spray one 8-inch round baking pan and one 8-inch square baking pan with baking spray or grease with shortening and dust lightly with flour. For easiest removal, line bottom of pans with parchment paper. Bring milk to boil over medium heat. Remove from heat. Slowly whisk in cocoa powder. Add finely chopped chocolate, place lid on pan and let sit for 3 minutes. Open lid and stir until melted and smooth. Some very small lumps of chocolate or cocoa powder may remain and that is fine. Allow to cool for 15 minutes, then stir in sour cream. Meanwhile, press Bob Evans Mashed Potatoes through a fine mesh sieve. Set aside. Beat butter on medium high using an electric mixer for 30 seconds. Continue beating as you slowly sprinkle in the sugar. Scrape the sides of the bowl and continue to beat until light, fluffy, and very pale yellow, about 3 min. Add one egg at a time, allowing it to become incorporated. Add vanilla and mashed potatoes. Turn mixer speed to low. Add 1/3 of the flour mixture and allow it to mix in a bit then add 1/3 of the chocolate mixture and mix until ingredients are almost incorporated into the batter. Repeat the process 2x until batter is thick. Equally divide batter between the round and square pans. Bake for 32-36 minutes, until a toothpick inserted in the center comes out clean. Allow to cool in pan for 10 minutes, then remove cakes and set on a cooling rack. Cool completely. Set cakes next to each other, and use a serrated knife to level the cakes so they are the same height. Set the square cake, bottom side up on a heart shaped cake board or serving platter so that the cake looks like a diamond. Cut the round cake in half. Place one half, bottom side up, on the top right part of the diamond and the other on the top left part of the diamond, forming a heart. To make the Creamy Potato Frosting press the mashed potatoes through the sieve, discarding any large chunks of potato. Put the mashed potatoes through the sieve a second time, making sure they are smooth. Set aside. Beat butter on medium high speed for 1 minute. Add mashed potatoes and beat until combined. Add two cups of confectioners sugar at a time, beating on low speed until incorporated then beat on high speed until light and fluffy. Add vanilla and 2 tablespoons heavy whipping cream and beat until combined. If the frosting is too thick, add the additional 1 tablespoon of heavy whipping cream. Frost cake. Stir red icing coloring into the remaining frosting. If the frosting becomes too thin, thicken it by adding some more confectioners sugar, 1 tablespoon at a time until you get the desired consistency. Spoon red frosting into a pastry bag fitted with a #6 pastry tip. Pipe dots around the bottom of the cake. Pipe hearts around the top outside edge of the cake. To pipe frosting hearts, squeeze a dot then pull downward. Squeeze another dot next to the first, pull downward into a point, creating the heart. To make rows of hearts, squeeze the next dot midway down the outer edge of the first heart, pulling the frosting just below the point of the first heart. Repeat on the other side. Continue piping hearts to create a border around the heart shaped cake, then create two smaller heart borders inside the outer border. 1 Set oven rack in the middle of the oven. Preheat oven to 350F. 2 Spray one 8-inch round baking pan and one 8-inch square baking pan with baking spray or grease with shortening and dust lightly with flour. For easiest removal, line bottom of pans with parchment paper. 3 Bring milk to boil over medium heat. Remove from heat. Slowly whisk in cocoa powder. Add finely chopped chocolate, place lid on pan and let sit for 3 minutes. Open lid and stir until melted and smooth. Some very small lumps of chocolate or cocoa powder may remain and that is fine. Allow to cool for 15 minutes, then stir in sour cream. 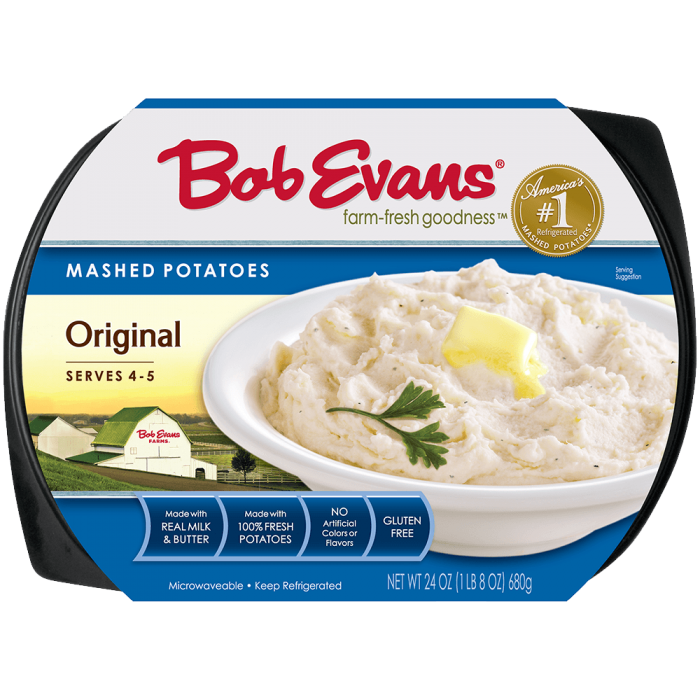 4 Meanwhile, press Bob Evans Mashed Potatoes through a fine mesh sieve. Set aside. 5 Whisk together flour, baking soda and salt and set aside. 6 Beat butter on medium high using an electric mixer for 30 seconds. Continue beating as you slowly sprinkle in the sugar. Scrape the sides of the bowl and continue to beat until light, fluffy, and very pale yellow, about 3 min. Add one egg at a time, allowing it to become incorporated. Add vanilla and mashed potatoes. 7 Turn mixer speed to low. Add 1/3 of the flour mixture and allow it to mix in a bit then add 1/3 of the chocolate mixture and mix until ingredients are almost incorporated into the batter. Repeat the process 2x until batter is thick. 8 Equally divide batter between the round and square pans. Bake for 32-36 minutes, until a toothpick inserted in the center comes out clean. Allow to cool in pan for 10 minutes, then remove cakes and set on a cooling rack. Cool completely. 9 Set cakes next to each other, and use a serrated knife to level the cakes so they are the same height. Set the square cake, bottom side up on a heart shaped cake board or serving platter so that the cake looks like a diamond. 10 Cut the round cake in half. Place one half, bottom side up, on the top right part of the diamond and the other on the top left part of the diamond, forming a heart. 11 To make the Creamy Potato Frosting press the mashed potatoes through the sieve, discarding any large chunks of potato. Put the mashed potatoes through the sieve a second time, making sure they are smooth. Set aside. 12 Beat butter on medium high speed for 1 minute. Add mashed potatoes and beat until combined. Add two cups of confectioners sugar at a time, beating on low speed until incorporated then beat on high speed until light and fluffy. 13 Add vanilla and 2 tablespoons heavy whipping cream and beat until combined. If the frosting is too thick, add the additional 1 tablespoon of heavy whipping cream. 14 Frost cake. Stir red icing coloring into the remaining frosting. If the frosting becomes too thin, thicken it by adding some more confectioners sugar, 1 tablespoon at a time until you get the desired consistency. 15 Spoon red frosting into a pastry bag fitted with a #6 pastry tip. Pipe dots around the bottom of the cake. 16 Pipe hearts around the top outside edge of the cake. 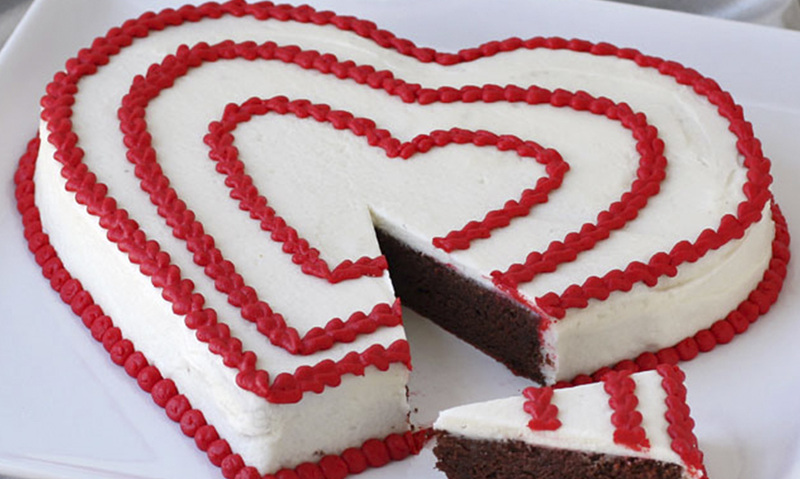 To pipe frosting hearts, squeeze a dot then pull downward. Squeeze another dot next to the first, pull downward into a point, creating the heart. 17 To make rows of hearts, squeeze the next dot midway down the outer edge of the first heart, pulling the frosting just below the point of the first heart. Repeat on the other side. Continue piping hearts to create a border around the heart shaped cake, then create two smaller heart borders inside the outer border.